We are celebrating the release of my new book Power to Change! 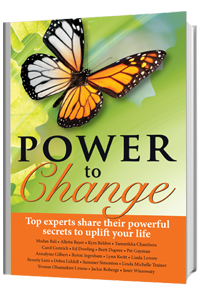 I am thrilled to share with you that I am a co-author of a new and exciting book entitled Power to Change. This is an incredible resource to support you in creating positive changes for yourself in your life. Get the Tools for Positive Change Right Away! Each co-author will be interviewed on their book topic. I will be presenting on my chapter, The Gift of Change. Everyone, regardless of where we are in your life, can benefit from personal development. We can all benefit from learning more tools and techniques for mastering and navigating change. Join us for this inspiring and insightful event. We are excited about this great book Power to Change. It can make a difference for you!